Edinburgh team ranked in top 8 in the world! Prince Chakanyuka is a chemistry student who is also part of Enactus Edinburgh. With colleagues from Edinburgh he recently attended the Enactus World Cup in the USA. Here he tells us about his experiences at Edinburgh and at the competition in California. I have always been a student who seeks to expand my knowledge beyond my primary studies, with a keenness on harnessing and honing a diverse range of skills in leadership, public speaking and entrepreneurship. I found the Enactus Society to be an opportunity for me to not only challenge myself to increase my business acumen, but to also engage in meaningful and life transforming projects. Enactus hosts annual national competitions, and Enactus Edinburgh came first in the UK for the first time this year! 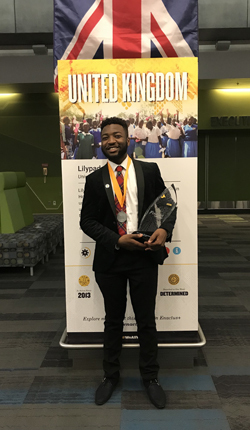 This enabled us to represent the UK at the Enactus World Cup in Silicon Valley where we managed to get through to the semi-finals and were ultimately ranked in the top 8 Enactus Teams around the world! In the past year, our projects collectively impacted nearly 4000 lives and this was a great success for us which we are very proud of and have attained further motivation to expand our projects and impact more lives. I am grateful to the School of Chemistry who funded my trip to California, and for the support and encouragement to join student societies. My involvement in Enactus has taught a range of transferable skills in project management, social entrepreneurship and leading and working in teams, which continue to complement my academic studies. I am a testament to the impact engaging in student societies can be as I managed to secure two internships last summer after my second year and in fields not related to my degree. I do not think I could have gotten this far if not for my involvement in a range of student societies, particularly Enactus. If you are student studying a STEM program, your degree gives you a wide range of technical skills which when complemented with soft skills, can go a long way in advancing your career or at least offering you a better chance to impact yourself and those around you. If you are like me and you do not know your career options yet, the opportunity to engage in such societies can help you get an idea and most importantly give you something meaningful to do outside of lectures and in cases like mine, a free holiday! I would recommend other students to challenge yourself and to think within, and outside the box, and if you can, think beyond the box. Enactus is a global organisation based in 36 countries, that supports students to solve global problems through socially and environmentally responsible businesses. In Enactus Edinburgh we have 7 social enterprise businesses; 4 international projects in Ghana, Malawi, India & Kenya, and 3 based here in Edinburgh. I am Project Manager for one of our local businesses called Edinburgh Candle Company. The Edinburgh Candle Company is a socially and environmentally conscious business that supports unemployed women and those facing language barriers to gain confidence, transferable skills, and a sense of community. Alongside making candles to earn an income, the women receive additional one-on-one employability training tailored to match their specific needs, whether it is to transition into employment, learn new skills or start their own business ventures. We sell our candles on campus and through our website.